I didn't get the title of this recipe quite right in my Weekly Dinner Menu column last week. Oh, well. It's not really the name that matters anyway. What matters is how wonderful this salad is. I've been making it ever since I received the February 2005 issue of Martha Stewart Living in the mail. 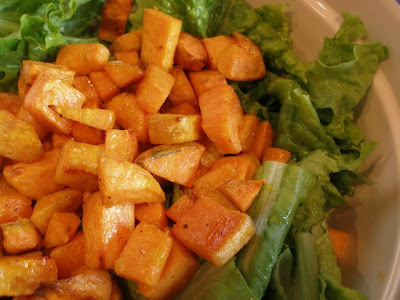 It's perfect for this time of year because lettuce is still lovely, our sweet potatoes were harvested last week and this salad's dressing is warm. Mmmmm...warm salad dressing. It does very well on it's own as the main dish. And, what could be healthier? Preheat oven to 400 degrees. Rub chicken breasts with ginger and 1/4 tsp. salt. Heat olive oil in an oven-proof skillet (or a regular one) to medium-high. Add chicken to the skillet and let it brown on one side. Add the sweet potatoes to the skillet, coating them in the oil and juices and turn the chicken over and brown the other side. You are not trying to cook the chicken through. Place the oven-proof skillet into the oven, or transfer the sweet potatoes and chicken to a pan with sides or an oven-safe dish that is large enough to spread everything out evenly without layering much. Roast at 400 degrees for about 25 minutes, stirring occasionally, or until the sweet potatoes are soft. While it's roasting, prepare the lettuce and place it in a large bowl. 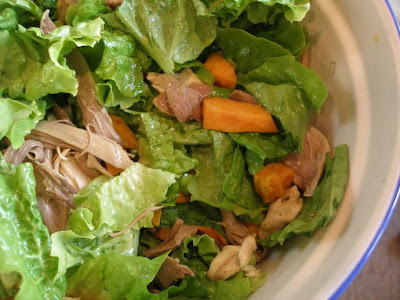 Cut the roasted chicken into bite-size pieces or strips, then place them and the roasted sweet potatoes on top of the lettuce, leaving the juices in the pan. To the juices add the cider vinegar, some freshly ground pepper, 1 tbsp. olive oil, thyme and a 1/2 tsp. salt. Stir together well, scraping the bits off the bottom of the pan. Right before serving, drizzle the warm dressing over the salad, toss well and serve immediately. This is the very best way to make this- with the roasted chicken. I had no chicken to roast at the time, so I used cooked and shredded chicken which you can see in the photo. This works okay if you add the chicken to the warm dressing and place it back in the oven to warm it before adding to the lettuce, but roasted is still best. This salad looks lovely.... I would like to grow sweet potatoes next year and the only place I have found to order them is territorial seed company... do you have any other suggestions? I'm interested where you found the seeds too/(bulbs?) for the sweet potatoes. Thanks for the comment about the 'new look' on my page. I'm enjoying a little more 'simplicity' these days. :) Picts to come of new school room soon. Off to buy sweet potatoes..urg... but your recipe has inspired once again! There are many vendors for sweet potato slips via mail order. Not sure what area you all are from but Johnny's Seeds provided ours this year. Steele Plant Company and George's are two I have been looking at for next year. Stay away from SandHill Preservation, I have not heard good things. Sometimes they can be found locally at the big box nursary centers as well.